Our Get Together Free package takes care of accommodation and transportation along with a complimentary Tour on Saturday. 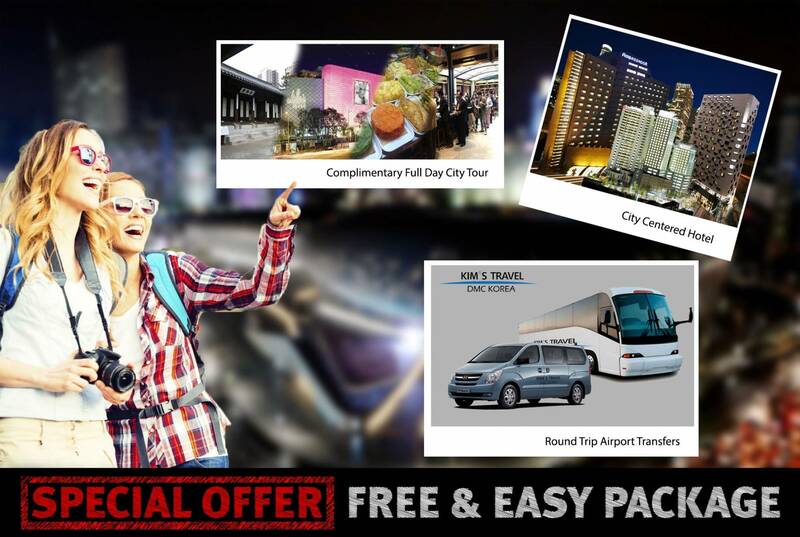 Our hotels are city centered, and Seat- in- coach meeting and sending transfers are included in the rates. *Remark: Your staying can be extended on your request. *Above prices may change during below golden holidays . - This offer has no monetary value and may not be combined with any other offer. - Pick up time at each hotel may vary. Advanced notice will be given by KIMS operator. - You can arrive in Seoul on any day of the week but if you want to get Free City Tour, you need to arrive in Seoul as below. Photo Stop at N Seoul Tower (Photo Stop) - Bring your own Lock. ◦ Suggested Activities : tea drinking/ orchid drawing – on own expense. Ginseng / Red Pine / Korean Herb / Diet- Beauty Mi (美) - Korean healthy food. Experience Kimchi making & Hanbok Wearing - experience wearing Korean Traditional Costume (Hanbok). ◦ SM Artium : Home of K-Pop idols like EXO!! Samsung D’light - Experience the dawn of a digital world with interactive exhibits at Samsung’s global exhibition space!